The history of coffee has been recorded as far back as the 10th century. During that time the drink was confined to Ethiopia, where coffee beans were first cultivated. Arab traders introduced the coffee beans to North Africa and from here the beverage spread to India & Europe. The most likely source of the word coffee, stems from the Arabic word ''gawha'' a shortened version of ''gahwat al bun'', or wine of the bean. Islam prohibits the consumption of alcohol and coffee provided an enjoyable alternative to wine. The first coffee house in London was opened in 1668 by one Edward Lloyd. It soon became popular amongst the city's merchants and maritime agents, eventually becoming Lloyds of London - the most famous insurance company in the world. The coffee house culture has become a fast growth industry, where people young and old can gather together and hang out, either relaxing on sofas or more formally at tables. Fashion has dictated the style of coffee we drink - from its humble beginning as a simple bean; we can now enjoy cappuccino, espresso, and latte - skinny and decaf; to suit our dietary needs and our taste buds. To refresh us and awaken us, coffee houses welcome families and TK Retail Design makes sure that is possible. Busy mums meet up for a gossip while the kids are at school and coffee houses also provide the ideal place to discuss business with clients or colleges. They welcome friends at the beginning or end of an evening –and are the ideal place to break the ice on a first date…! Cakes and pastries usually accompany the coffee. The contemporary coffee shop design is often open plan where the customer can see the coffee freshly prepared in a clean and hygiene setting. 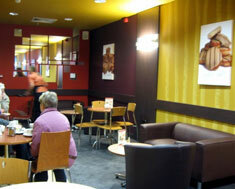 Coffee houses are also becoming the norm in unusual places, found in tanning centres, furniture stores and supermarkets .The job of the retail design consultant would be to fit the coffee house within its surroundings, making a haven for the shoppers in store .The retail design provides for customers and staff alike a safe environment, enabling good service in a pleasant atmosphere. Shopping mails have always been an ideal place to build a coffee house, usually in the centre, with an array of shops surroundings them, making it a focal point to meet up or take a welcome break from shopping, or simply with the gentlemen in mind – a great place to read the newspaper…. 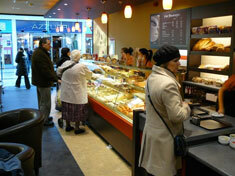 TK Retail Design Consultants can design your shopping mall coffee house as a self contained open plan retail unit. See Coffee Shop Design page for details. As trends come and go its important that both the coffee houses and the retail design consultants keep ahead of the times with cutting edge technology, ensuring the customers’ needs are met. It is critical that when you do sit down at a coffee house, the coffee you are drinking has come from the finest coffee beans, the coffee machine is giving best performance and coffee is served at the right temperature in a relaxing, welcoming manner. Coffee shop culture has also taken the customer outdoors, even when it’s chilly. In the summer, coffee houses, with their parasols shading from the sun, make an attractive scene, coffee drinkers spill out into the street watching the world go by. Essentials are good ambiance and relaxed atmosphere, complemented by the cool crisp designs that TK Retail Design Consultants offer their clients. The ardent coffee lover likes to know where the coffee bean comes from and sometimes even what make of coffee machine is used. Most importantly if the coffee is fresh, the strong coffee aroma will attracts passers by to join in the ritual. In some coffee houses the customer would be able to purchase the coffee beans or already ground coffee to take home. So after a demanding day at work, a hectic shopping trip or simply meeting with friends, the coffee house culture is here to stay. Supported by attractive, practical retail designs and project managed by TK Retail Design Consultants, you are sure to attract the most discerning customers to your building. Coffee Shop & Coffee House Culture. Shopping Mall Self Contained Open Plan Units. Coffee Shop Designs from TK Retail Design Consultants.